I love the look of Japanese gardens and I love the one at the Missouri Botanical Garden. I think I would like to have a similar feel to my garden, but I have very narrow backyard. It is all grass and only about 20 feet deep. I am stuck on what to do next. Do I have enough space to create a nice Japanese garden in a small yard?- Mary M.
The answer to Mary’s question is a resounding YES! She has plenty of room for a Japanese style garden. In fact I would argue that smaller sized lots are the BEST size for Japanese gardens. Residential gardens in Japan are often tiny in comparison to their counterparts in the US. Since Mary is looking to create a garden with the feel of a Japanese garden, we should consider what some of the design ideas and parts behind such a garden. Here are a few principles and ideas that I feel Mary should keep in mind as she is looking to create a Japanese garden in her backyard. 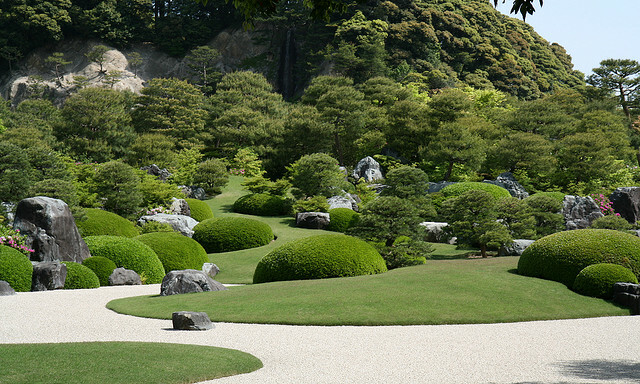 Most Japanese gardens are representations of nature. You are not trying to create a nature preserve, but instead are trying to imply nature. 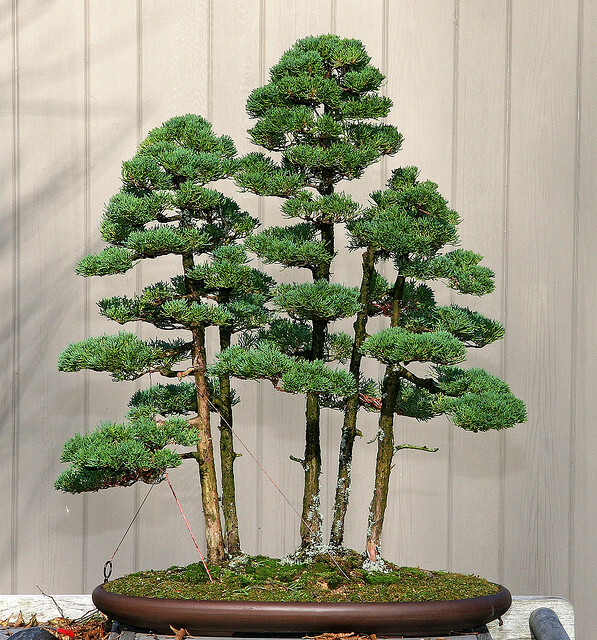 A small bonsai tree can do this, so we know size is not a requirement. The Japanese consider their gardens and homes to be one. The Japanese want bring nature as close to the house as possible. There are practical benefits to this, how many of us live in areas where we are mostly indoors for 5 months out the year. If you can still see and enjoy your garden from indoors during these months, it is a great benefit. You want to create a garden where people feel like they belong. A 15 foot tree is more in scale with people than a 80 foot tree. Don’t get me wrong, I love an 80 foot tree but they can make us feel small and insignificant. That’s not the feeling I want when I am in my garden. (Click for my post on why you should plant smaller shade trees). Another big plus of creating a Japanese garden in a small yard is reduced maintenance, as Japanese-style gardens require more maintenance than most people think. It’s important to enclose and isolate your garden from the outside world. It can be separated with either fences or plants. It’s hard to imply nature and create a relaxing experience for visitors to the garden when that crazy old lady with the seventeen cats in the lot behind yours is watching you. If your house is in the middle of woods, you may be able to ignore this. If not you may want to see this post on enclosing your garden space. The majority of your plants should be evergreens, such as pines, boxwood, holly, azalea, and moss. These do not have to be large evergreens. In fact at Adachi Art Museum, arguably the best Japanese garden in the world, have Japanese Black pines that while they appear much larger due to tricks of perspective are not a lot taller than your average NBA basketball player. This pine tree is probably no taller than your average NBA center but still evokes a feeling of a old tree. When planting your Japanese garden in a small yard, you may want a smaller number of species of plants. This will help you avoid a hodge-podge look of too many plants. 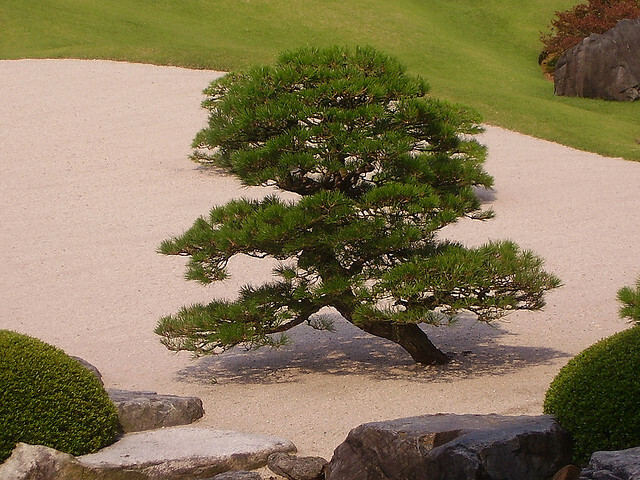 In a lot of Japanese gardens, there might only be three or four main types of plants. Adachi is another great example of this. At the Adachi Art Museum’s garden, there are several scenes that are made up of only a small variety of plants, but still look perfect. In the scene below there are sheared azaleas, trained pines, grass, and a few other plants. This simple plant palette along with boulders, gravel beds and the background of the forest behind it make a very nice composition. Water is a key element in a Japanese garden, be they real water features like ponds, waterfalls, or stone water basins or if they are implied water as in a dry raked garden or naturalistic dry creek bed. 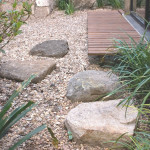 For small spaces a stone water basin is a perfect easy care solution. 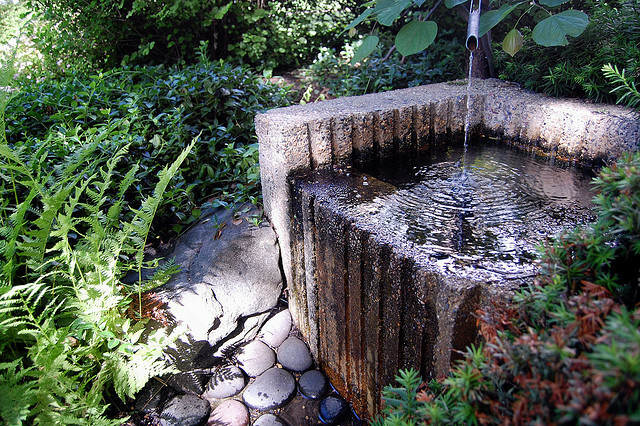 Water features in Japanese gardens do not need to be large ponds or complicated waterfalls. This simple basin brings the sound and feel of water into a small garden space. 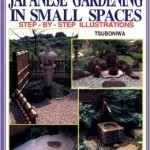 Most of the elements that I consider a necessary part of a Japanese garden do not require a lot of space. It may take a little more thought to get everything to fit, but with proper planning and a good design you can create a high quality garden in a small space. Over the next few posts, I will design a Japanese inspired landscape for a narrow backyard like Mary’s. Here is the first post in that series. Is there a Japanese Garden that would be more suited to Florida-the types of plants that would be used? Our garden challenges are different than the traditional south like Georgia and Alabama or anywhere else. I’m busy now taking out some kind of spreading holly bush that had been planted a long time ago and is in all the wrong places: so we can grow holly, and we do have pines but they are very tall. I would like to just give the “impression” of Japanese design because I find it so calming in comparison to the energy of the strong sun and uncontrollable growth. It will show you a Hoichi Kurisu designed garden in your climate.